SCVHistory.com | Acton | Buck Ware's Soledad Sands Park, Advertisement 1976. Buck Ware's Soledad Sands Park. A Quiet Place in the Country. Advertisement published in the Newhall Signal, July 9, 1976. 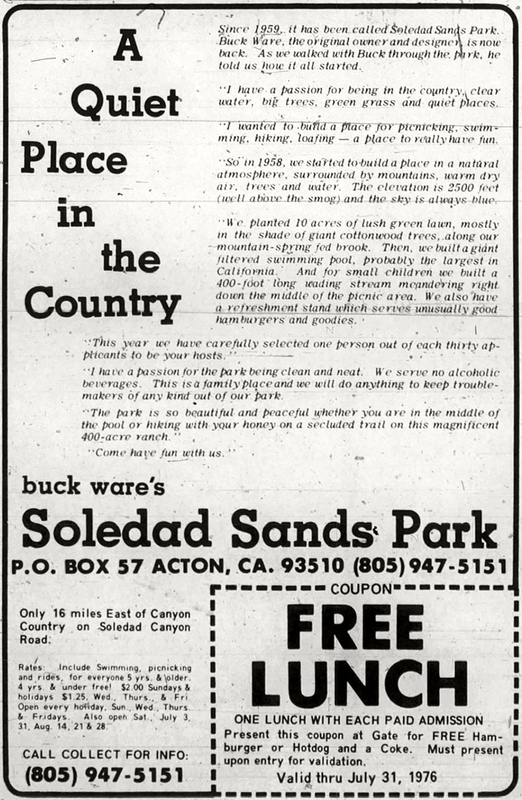 Advertisment for Buck Ware's Soledad Sands Park, est. 1959 at 4700 Crown Valley Road in Acton. The Thousand Trails RV park chain bought it in about 1980. Since 1959, it has been called Soledad Sands Park. Buck Ware, the original owner and designer, is now back. As we walked with Buck through the park, he told us how it all started. "I have a passion for being in the country, clear water, big trees, green grass and quiet places. "I wanted to build a place for picnicking, swimming, hiking, loafing — a place to really have fun. "So in 1958, we started to build a place in a natural atmosphere, surrounded by mountains, warm dry air, trees and water. The elevation is 2,500 feet (well above the smog) and the sky is always blue. "We planted 10 acres of lush green lawn, mostly in the shade of giant cottonwood trees, along our mountain spring-fed brook. Then, we built a giant filtered swimming pool, probably the largest in California And for small children we built a 400-foot-long wading stream meandering right down the middle of the picnic area. We also have a refreshment stand which serves unusually good hamburgers and goodies. "This year we have carefully selected one person out of each thirty applicants to be your hosts. "I have a passion for the park being clean and neat. We serve no alcoholic beverages. This is a family place and we will do anything to keep troublemakers of any kind out of our park. "The park is so beautiful and peaceful whether you are in the middle of the pool or hiking with your honey on a secluded trail on this magnificent 400-acre ranch. "Come have fun with us." P.O. Box 57, Acton, Ca 93510 | (805) 947-5151. Only 16 miles east of Canyon Country on Soledad Canyon Road. Rates: Include swimming, picnicking and rides, for everyone 5 yrs & older. 4 yrs & under free! $2.00 Sundays & holidays; $1.25 Wed., Thurs. & Fri. Open every holiday, Sun., Wed., Thurs. & Fridays. Also open Sat., July 3, 31, Aug. 14, 21 & 28.